Our Saturday morning departure from Charleston Maritime Center is timed at low slack tide. Our course takes us east through the ship’s channel towards the inlet, then north to the Ben Sawyer bridge where Cutter Loose is one of six sailboats waiting for the scheduled hourly opening. The bridge tender is in a feisty mood today. She admonishes the waiting boats to move closer to the bridge so as to minimize the period of time that the bridge remains open. The flood tide is pushing the boats towards the bridge. Everybody is doing their best to hold their position until the opening. Nobody is particularly anxious to move closer to the bridge. Being swept into the bridge by the current is not a pleasant thought. A Mexican standoff ensues. The gates are down. Traffic is stopped. The bridge tender refuses to open the bridge until the boats move closer. The skippers refuse to move their vessels closer to the bridge until it is open. Unpleasant words are exchanged over the VHF radio. Finally, the bridge tender relents and the bridge opens. At the Isle of Palms, the ICW is congested with weekend boaters. 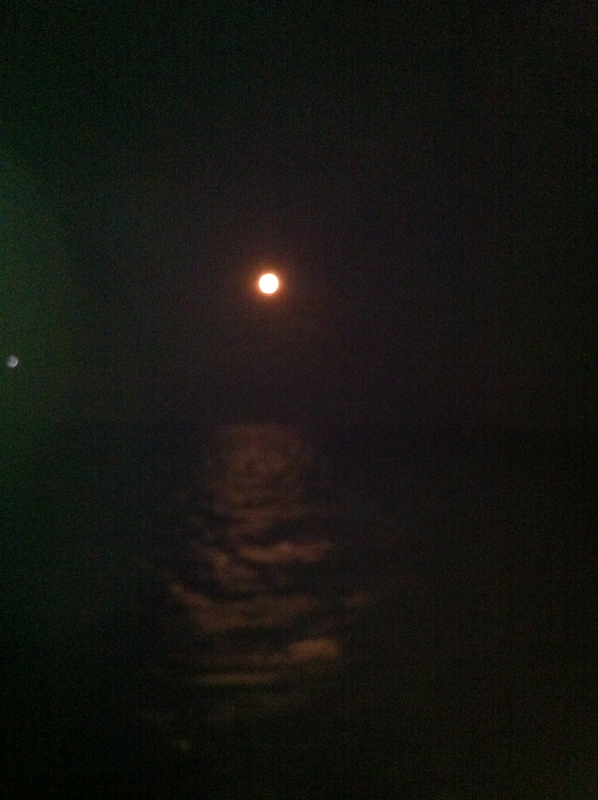 The tide has begun to rise, but water depths are abnormally low today due to the gravitational pull of the full moon, a condition known as a spring tide. At one point, Cutter Loose becomes grounded momentarily in the middle of the channel. To make matters worse, the greenhead flies have decided to join us in the cockpit for today’s sail. 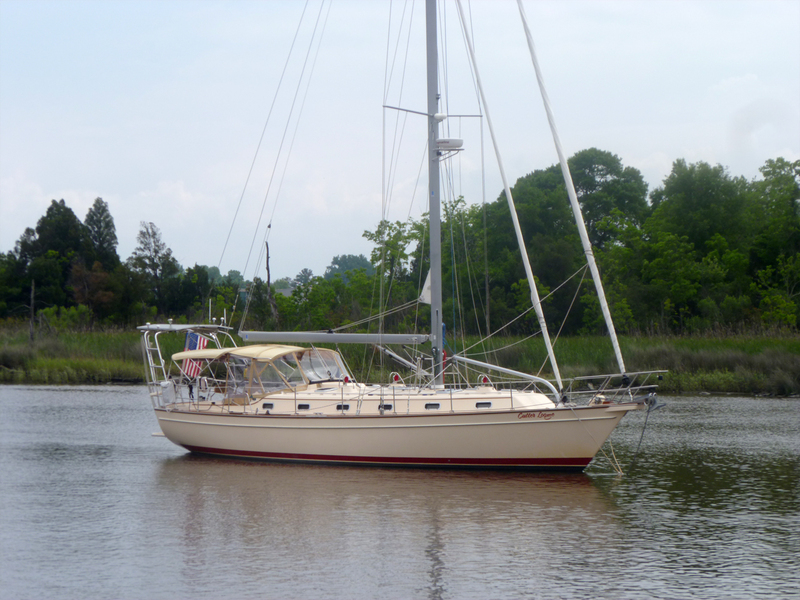 Our destination today is an overnight anchorage at Awendah Creek, 23 miles north of Charleston. The wind has been calm all day. But as we prepare to drop the hook, the wind is gusting to 20 knots. The salt marshes protect Cutter Loose from waves, but not from the wind. A cold front will approach the area overnight, bringing showers and thunderstorms. 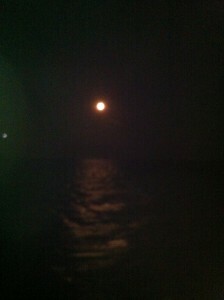 At dusk, the “supermoon” appears in the eastern sky while lightning is visible to the northwest. Lightning, thunder and rain remain with us into the early morning hours. Fortunately, the humidity falls and the wind subsides with the passing of the thunder squalls. By Sunday at dawn, the cold front has passed to the south and sunny skies return to the South Carolina coast. Our destination today is Georgetown, just 23 miles to the north. As we rejoin the ICW, shrimpers are visible in the ocean just above the marsh grasses. These waters are part of the Cape Romain National Wildlife Refuge. As if on cue, a lone alligator crosses the bow of Cutter Loose and swims to shore. The smokestacks of Georgetown are visible on the horizon as Cutter Loose enters Winyah Bay, an inlet to the Atlantic Ocean. Cutter Loose is anchored in Georgetown harbor. Most of the shops and restaurants in town are closed today. We manage to find a local restaurant to host our Sunday evening dinner with Catspaw and Island Spirit. Monday morning is overcast with cooler temperatures and low humidity. Our destination today is Barefoot Landing Marina in Myrtle Beach, about 35 miles to the north. 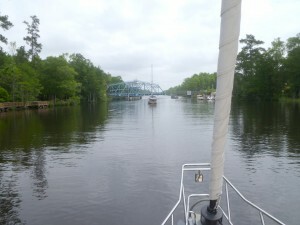 The ICW follows the Waccamaw River valley for most of this journey. 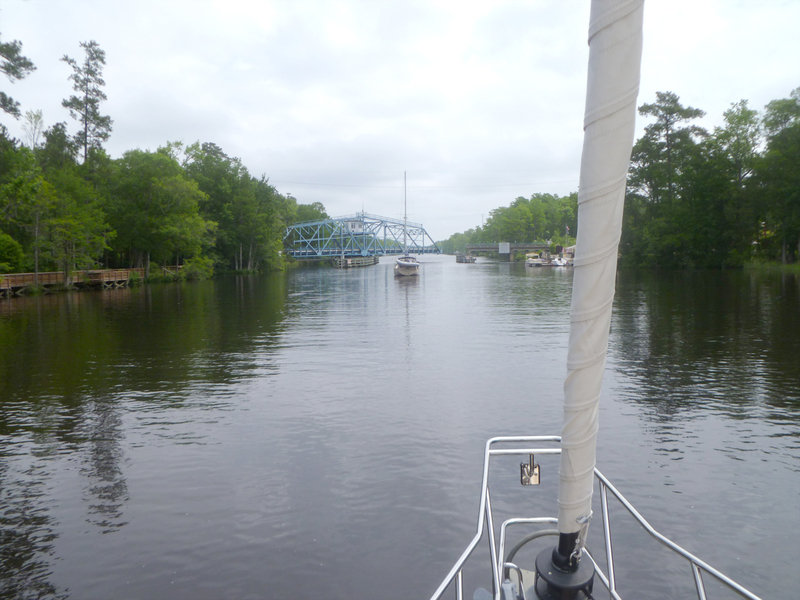 The brown/black water of the Waccamaw is in contrast to the gin-clear water of the Bahamas. The Waccamaw meanders through the pristine Waccamaw River National Wildlife Refuge, where the banks are lined with cypress trees draped in Spanish moss that support the nests of eagles and osprey. The sound of birds makes this passage feel as if we are sailing through a jungle. The landscape changes dramatically about 20 miles south of Myrtle Beach as the banks of the ICW become developed with large homes, condos and golf courses. Barefoot Landing Marina is part of a shopping mall that features outlet stores and restaurants, an unusual diversion along the waterway. We enjoy a stroll through this urban setting before sailing north in the morning.